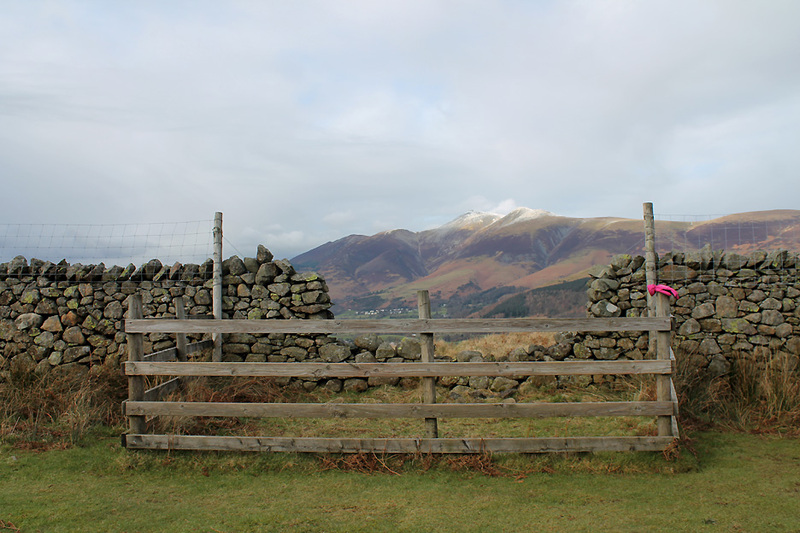 " Walla Crag above Keswick "
Date & start time: Wednesday 24th February 2016, 2 pm start. 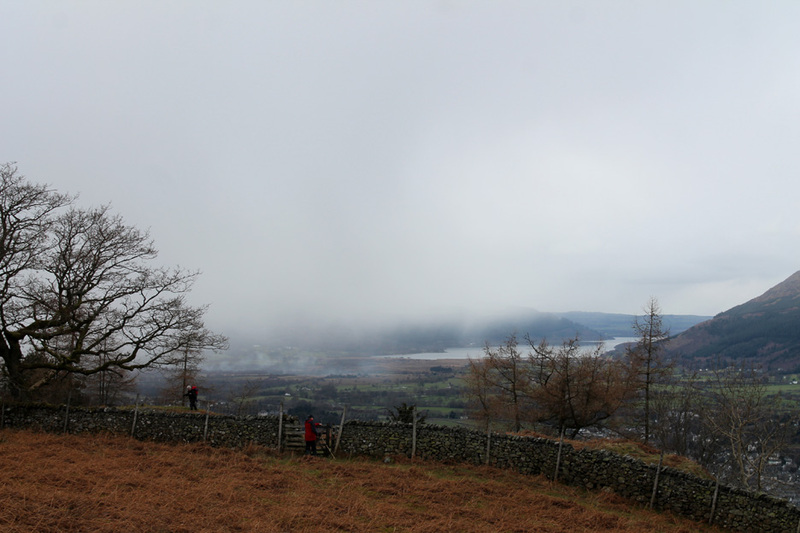 Places visited : Brockle Beck, Walla Crag and back. 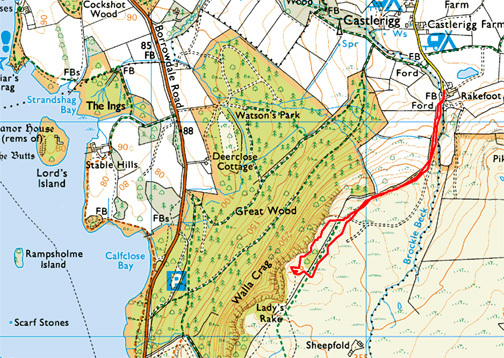 Walk details : 1.65 mls, 500 feet of ascent, 1 hour. Weather : Overcast and a forecasted 20% chance of a wintery shower. 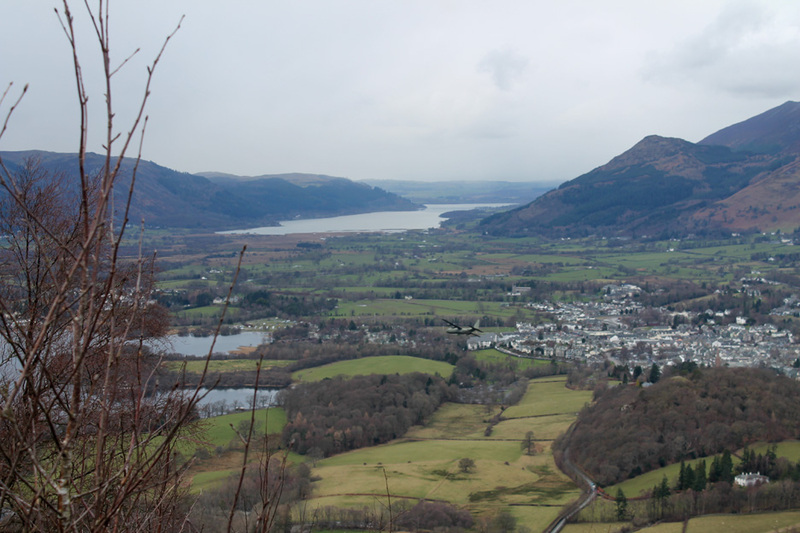 Some shopping to do in Keswick in the afternoon, so we planned a walk up Walla Crag. The weather suggested the possibility of a shower but it won't be a long walk so that shouldn't be a problem. Hopefully the views from the top will be fine. 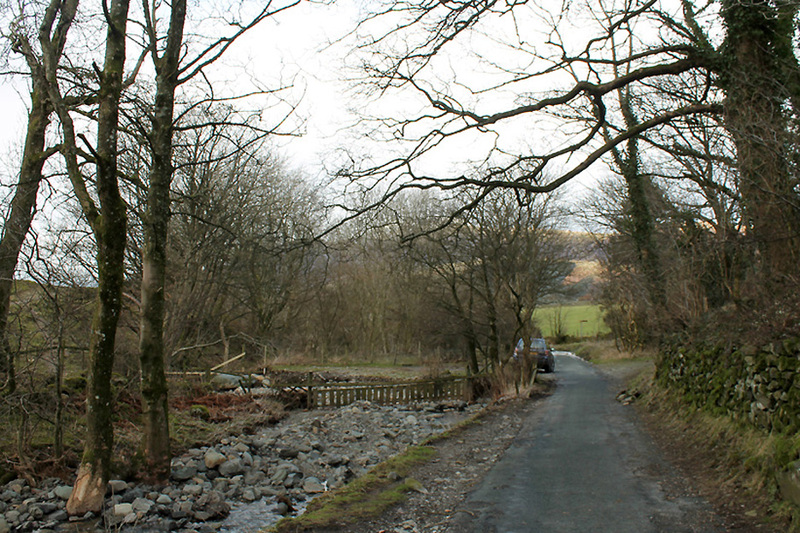 Parking for three or four at the end of the road below Rakefoot Farm . . . we were the only one today. 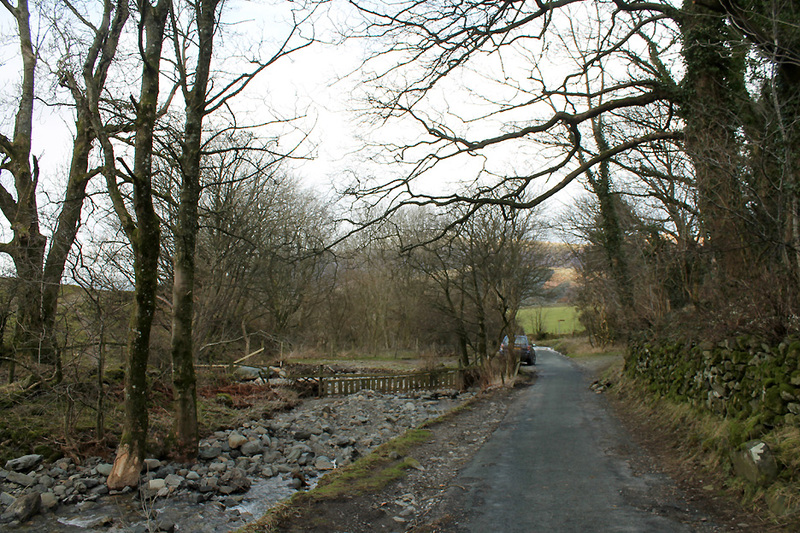 The Brockle Beck on the left is full of fresh gravel that has been disturbed by the recent floods. but there's not as much on top as when we walked there a couple of weeks ago. 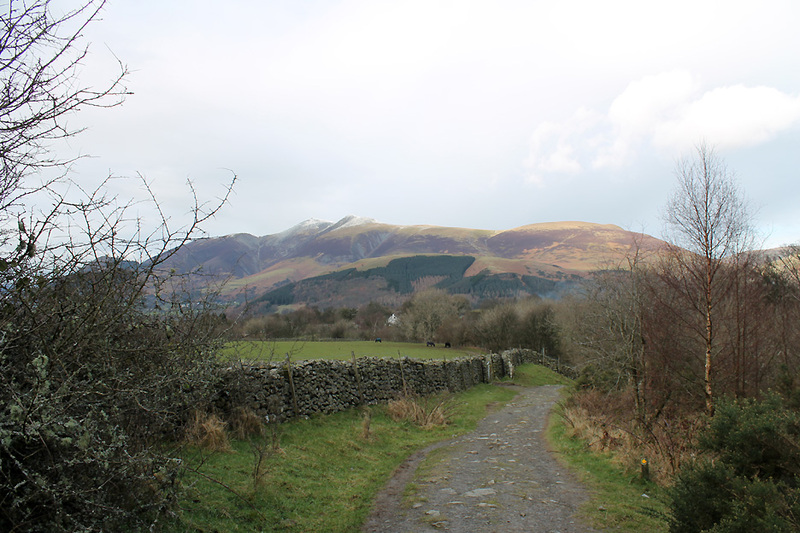 Blencathra looking suitably cold as well . . . the smoke is from a garden fire in the Chestnut Hill area. The white area behind the farm is "Rakefoot tarn". I can't say I've noticed it before but it is shown (unnamed) on the map. 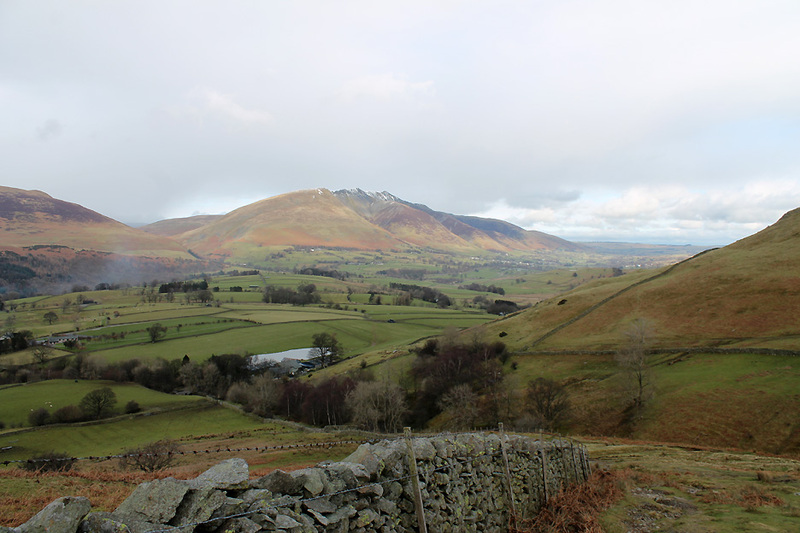 The wider view as we climb up alongside the wall . . .
. . . and on towards the summit of Walla Crag. Anyone lost a pink glove ? 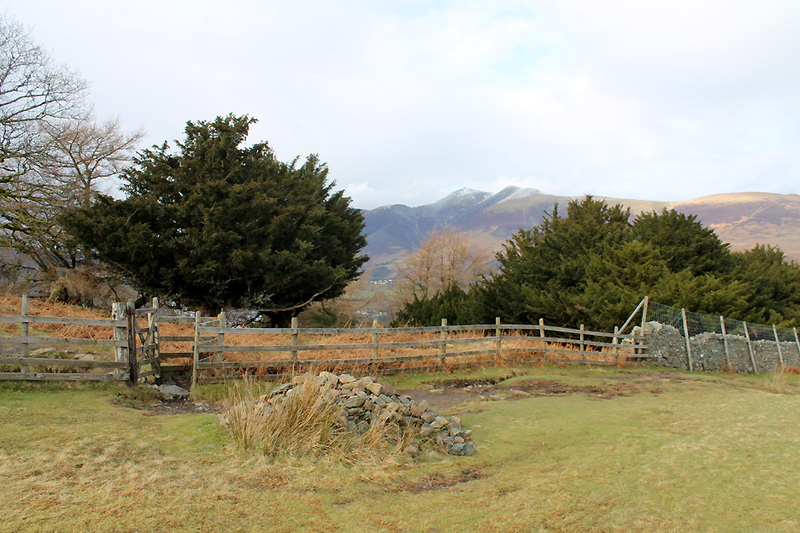 The summit of skiddaw seems to have gained a snow pyramid . . . but it is only a passing cloud. To our left is the extended Helvellyn Range . 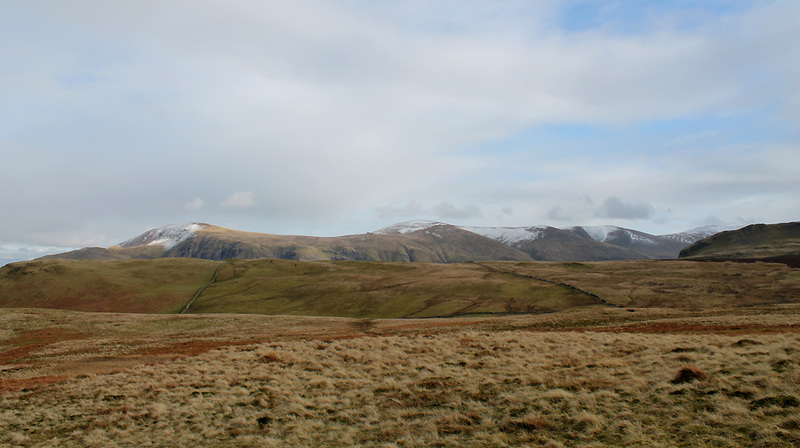 . . Clough Head and the Dodds up to Raise. Near the top of the rise we take the first gate out towards the edge of the crags past some lovely old yew trees. 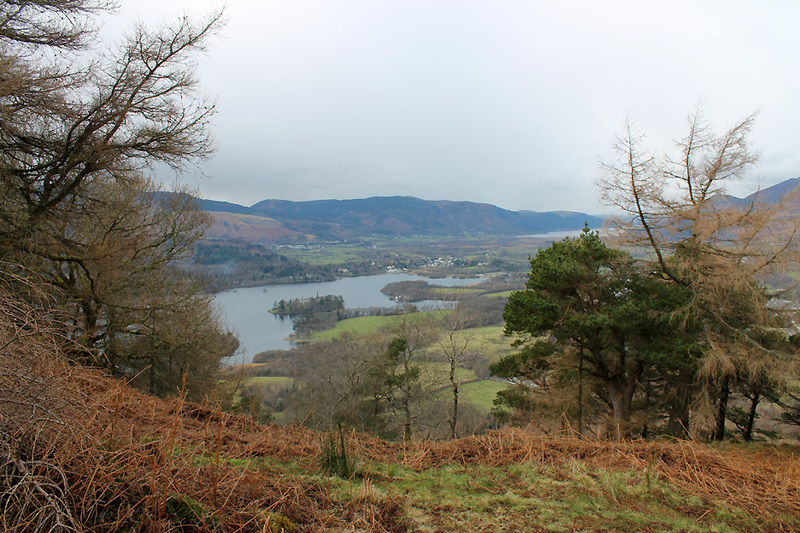 Lower down the trees include Larch and Scots Pine and through them we get a view of the bottom end of Derwent Water. The good path skirts the edge and gives lovely views down to the rest of the lake. 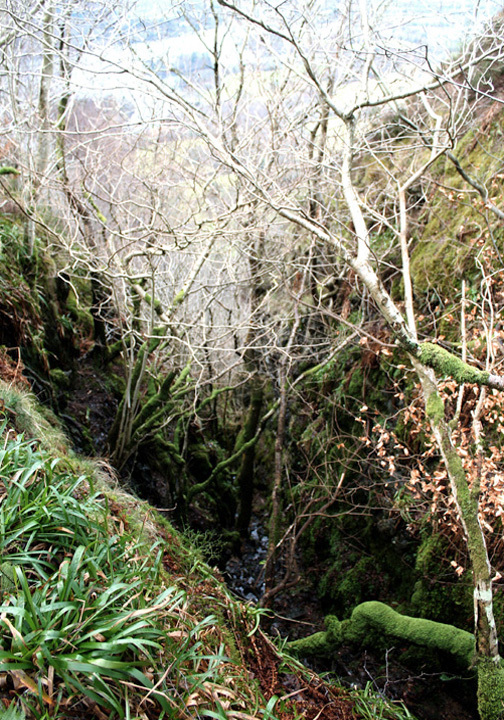 A deep little ravine but not Lady's Rake. 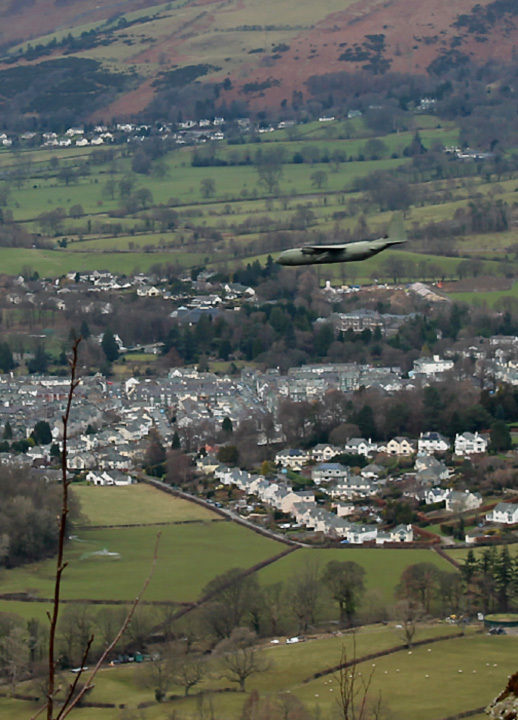 Flying low over the Castle Hill houses. overpowered the gentle sound of the ice cream vendor's jingle letting folk in the houses know that he was around. Standing on top of the world . 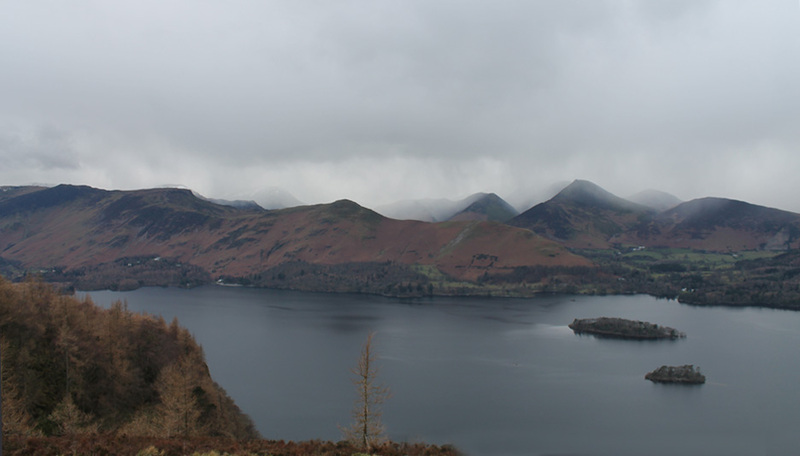 . . looking across to Catbells and Causey Pike. That looks like the " 20% chance of a shower " heading our way ! However the way that it is moving it looks more like a 100%, not 20% chance of a wintry shower for us. Taking the camera for a quick spin . . . 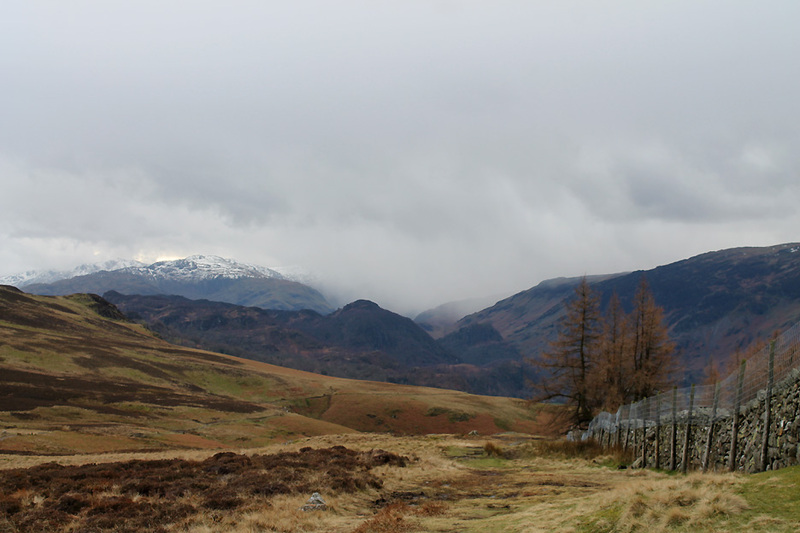 The rain or snow is working its way across upper Borrowdale. 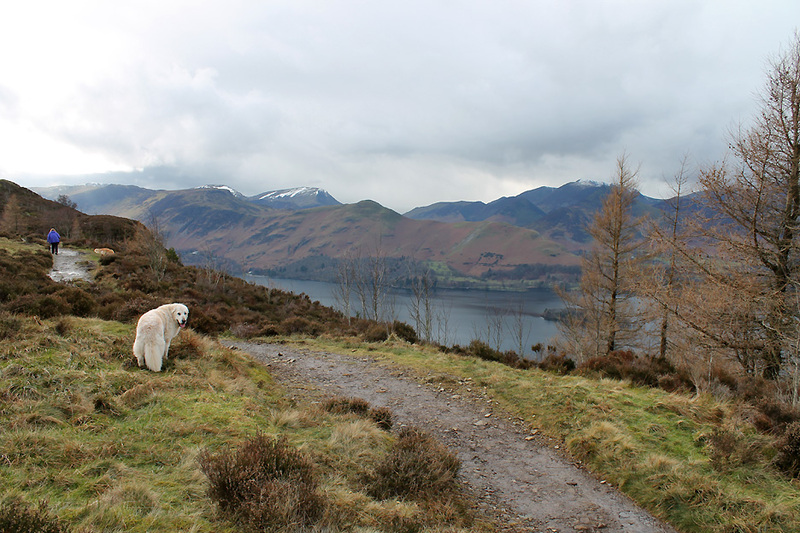 We retrace our steps, chatting to a couple up in the Lakes on holiday from Wrexham on the way down. but decided against it, probably due to the steep slope or the fact that the path is rather indistinct. 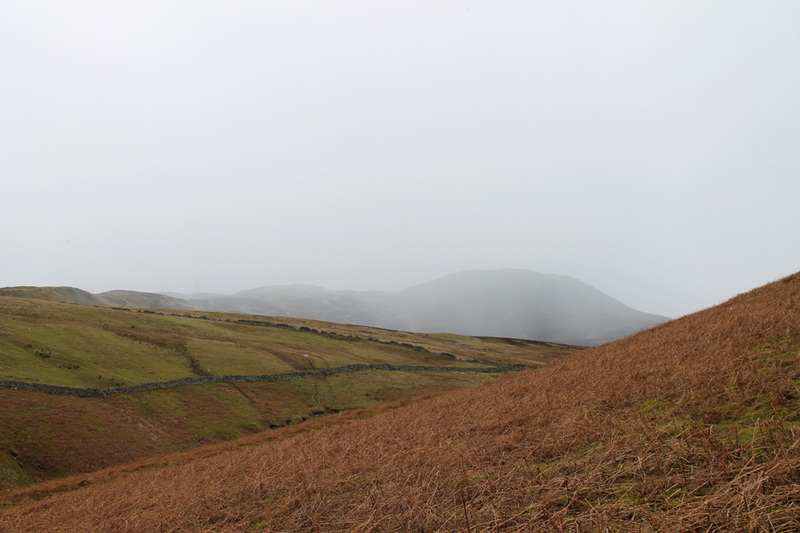 The poor weather has crept all around and now covers Bleaberry Fell . . . it looks more like snow rather than rain. Thought so . 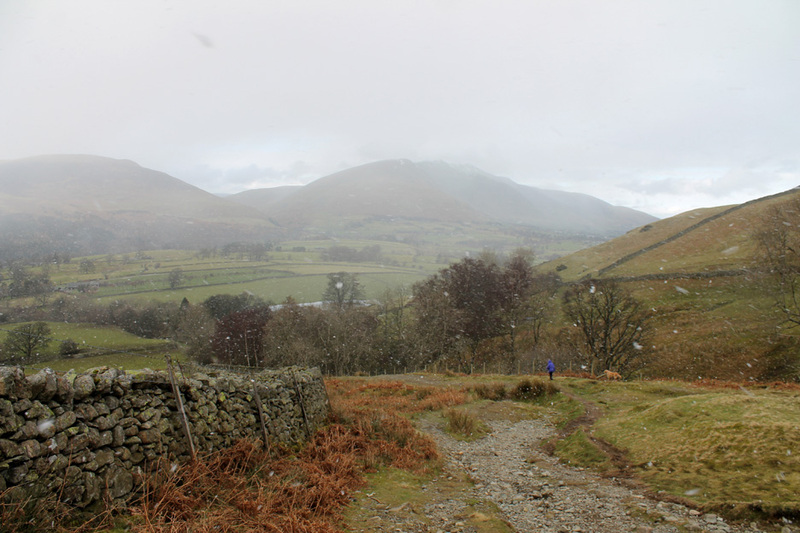 . . the large white flakes blow in the strong westerly breeze as we descend to the car. The visibility has gone . . . and so have the horses. They are sheltering in the trees lower down but the sheep in the same field don't seem to mind the weather. 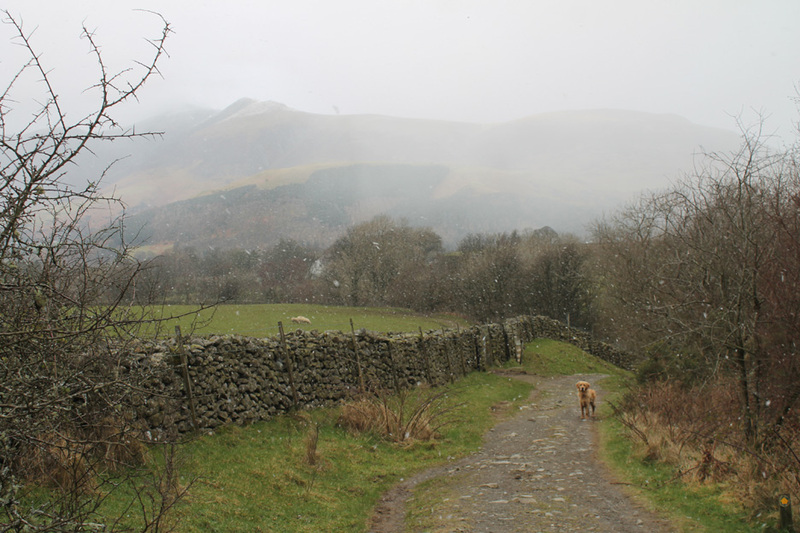 The snow shower passed and as we drove home the visibility returned . . . funny old thing weather ! This site best viewed with . . . a warm, wind-proof jacket that copes with a little bit of snow.